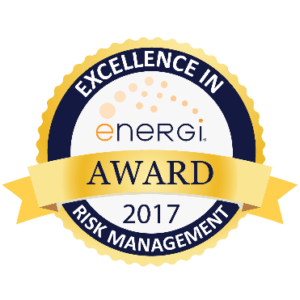 Griffin, Georgia – Spalding Gas has received Energi’s 2017 Excellence in Risk Management Award for being a leader in the implementation of Energi safety and risk management programs. Energi, a leading provider of Insurance and Risk Management Programs, recognized Spalding Gas as being the “Best of the Best” at eServices’ Risk Management Summit in Las Vegas, Nevada on October 18, 2017. Spalding Gas’ focused commitment to safety, implementation of risk management best practices, and willingness to learn and apply new safety techniques have enabled them to set a future standard of excellence amongst industry peers. For more information on Spalding Gas, please contact Darrell Whatley at 770-228-8484. Energi Inc. is the parent company for Energi Insurance Services, Inc. (MGA, Wholesaler & Program Manager), eRisk Solutions (LP Safety, Accident Recon, Environmental Management Services, Fire & Explosion Experts), eClaims Management (Claims TPA), eMarketing Strategies (Marketing Services Company) and eTech Services (Technology Services Company for the Insurance Industry) . Through these companies, Energi offers specialized insurance programs along with support services meant to reduce client’s long-term loss costs and enhance their productivity. Energi Inc. delivers these products to the market through a distribution strategy based on a regional network structure supported by a team of in-house sales professionals working in conjunction with 450+ independent brokers appointed in key markets. Get a Propane Water Heater For Free! Spalding Gas will give you a replacement tank heater and install it for the parts and labor charge only. All you have to do is agree to buy propane from us for 3 years. ©2019 Spalding Gas. All rights reserved. Website by Eyesore, Inc.